An iron church was opened in Ocklynge, between Eastbourne and Willingdon, in 1892 (CDK 1892 pt 2 p147) and Sir A W Blomfield was asked to design a permanent one. 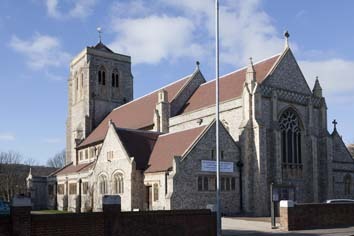 In the event, following the preference in Eastbourne for architects with local links, G E S Streatfeild was chosen and the eastern parts of a church were opened in 1901 (B 81 p470). After a bequest of £8000 in 1909, the nave and tower were finished in 1911, when W O Milne, who was linked with Streatfeild, was also involved, according to his entry in WWA 1923. The pebble-flint-faced church, approached from the east, is mostly in C14 style, with a big traceried east window. This was conservative by 1900, but the four-centred clerestory windows in C15 style show a newer eclecticism. The massive tower and low pyramid spire dominate the exterior. Inside, the tower and chancel arches are both tall, creating a spacious effect. The arcades have the C14 device of no abaci. The best feature, aside from the massing of the exterior, is the roofs. That in the nave combines hammerbeams and ties, and the trusses spanning the aisles rest on the piers. The chancel is flanked to the south by vestries and to the north by a chapel. This has another fine roof, this time with collar-beams. The chancel was altered in 1937, when P D Stonham redecorated the reredos and other fittings (CDG Jan 1937 p21) and at the same time H M Pett undertook repairs (ICBS). 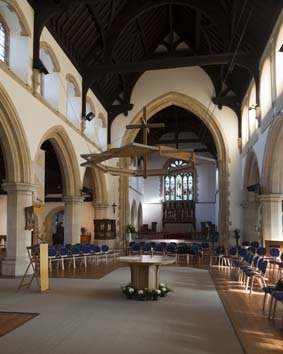 The church was re-ordered in 2005, with chairs in the nave arranged around a central table, placed beneath an open canopy (CBg 94 (July/August 2005) p72). Probably at the same time the north chapel was separated by a glazed partition. Altar rails: Formerly in St Mary, Eastbourne (Budgen (1912) p199). 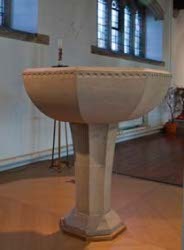 Altar table and open canopy above: K Jones, (BE(E) p338), 2005. Font: Graceful with a shallow bowl, 1952. 1. 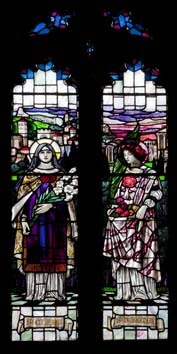 (East window) J Powell and Sons, 1901 (Clarke papers). 2. 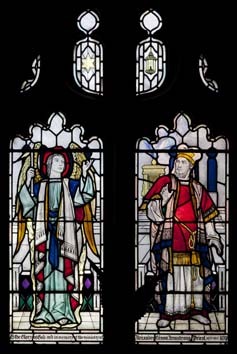 (North chapel east window, two southern lights) J Powell and Sons, 1901 (Order book). 3. 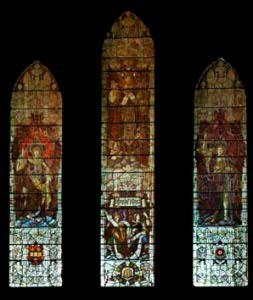 (West window) P Bacon and Co, 1923 (CT 12/1/1923) Poorly lit, it comprises three separate lights, each containing a single figure. It is stated to come from the demolished church of St Anne, Upperton Gardens (BE(E) ibid). 4. (South chancel) V Whall, it is said to have been made in1930 (DSGW 1949) though the faculty apparently dates from 1925 (www.stainedglassrecords.org retrieved on 24/3/2014). It is said to be based on a design by her father (BE(E) ibid). 5. 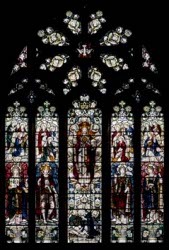 (North chancel, third window) R de Montmorency, 1950 (DSGW 1952). 6. 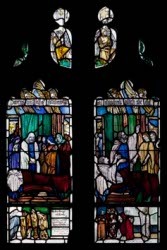 (North chapel, first north window) M Chilton, 1928 (BE(E) ibid). 7. (North chapel, second north window) R de Montmorency, 1958 (DSGW 1958). The design of both these windows is rather busy, though the colouring is good.